You can find a few of us in the office starting the day with this delicious, nourishing, and warming start to the day. 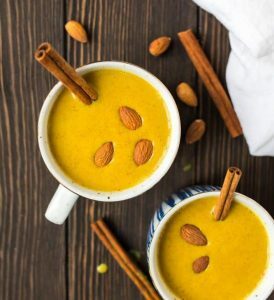 It has its roots as an Ayurvedic staple (Ayurveda is the sister-science to yoga, rich with ancient wisdom), but functional health experts tout its benefits, too. The herbs and spices involved are great for warming the body, decreasing inflammation, and amping up your immunity – perfect for these seasons when you spend more hours indoors, sharing air (and germs) with other people. Bring this to slight boil and let simmer. Pour it through a strainer into your mug and enjoy as a start or an end to the day.